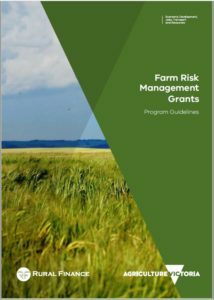 The Victorian Government’s Farm Risk Management Grants program opened Friday 1 July 2016. The program supports drought affected farmers with business planning, training and on-farm preparedness. The program provides eligible farm businesses with up to $10,000 to improve risk management and drought preparedness practices and enhance overall farm performance. Eligible farmers in the following local government areas are encouraged to apply: Buloke, Yarriambiack, Loddon, Northern Grampians, Horsham, Hindmarsh, Gannawarra, Pyrenees, Central Goldfields, West Wimmera and Ararat. The $1.5 million Farm Risk Management Grants program is part of the Victorian Government’s $27 million Drought Response Package. The Package targets north west Victoria, which has been most seriously impacted by drought over a prolonged period. contact Rural Finance on 1800 260 425 or visit www.ruralfinance.com.au/Industry-programs.